At this morning’s press conference at CCMC, the new report from the Collaborative Media Initiative was launched. 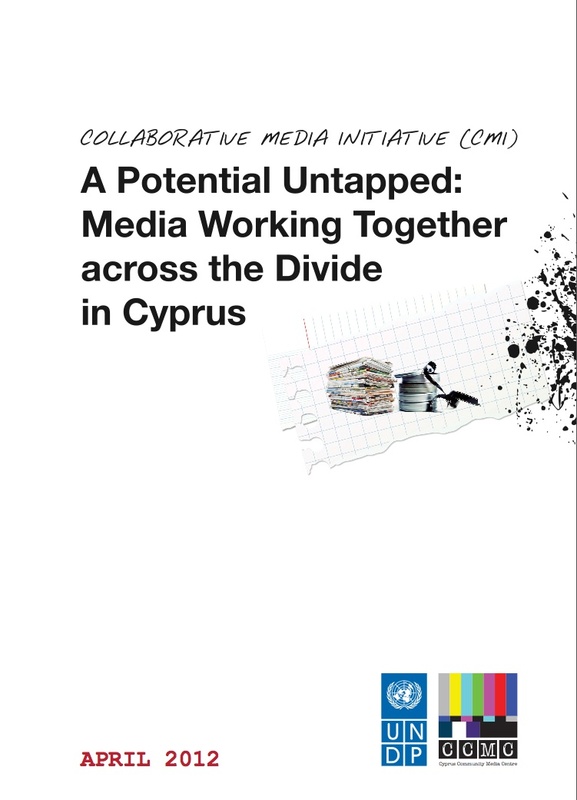 To read about the untapped potential for media collaboration in Cyprus, click here for a pdf of the report. 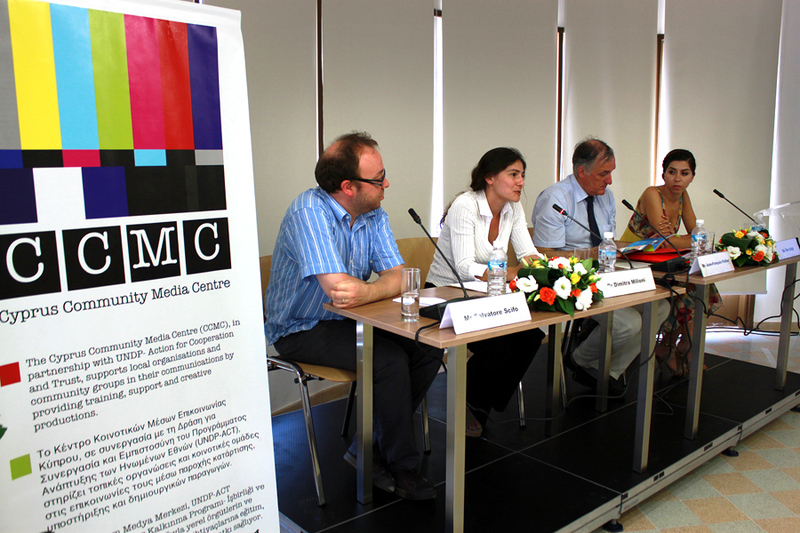 On Thursday 15th September, the Cyprus Community Media Centre (CCMC) hosted an information afternoon for visiting journalists from the South Caucasus region. The journalists are participating in a project financed by COBERM – Confidence Building and Early Response Mechanism, entitled “Media cooperation and peace journalism in the South Caucasus”. The relevance of the meeting was heightened due to the fact that the project shares similar aims and objectives to the Collaborative Media Initiative (CMI), implemented under the auspices of CCMC, as both projects aim to contribute towards an environment of cooperation between media representatives through activities including networking and information exchange. The meeting began with a briefing by Roland Gomez, Spokesperson for the United Nations Peacekeeping Force in Cyprus (UNFICYP), who outlined the history and mandate of UNFICYP, as well as the current state of negotiations aimed at resolving the Cyprus Problem. This was followed by a presentation by CMI Project Coordinator Michalis Simopoulos, who highlighted the most important features of the media landscape island-wide, and highlighted some of the major activities of the CMI. The meeting was also attended by members of the CMI Working Group (WG), a team of media professionals who provide strategic advice and support for the implementation of the project. The Q&A session that followed enabled the visiting journalists to discuss with the CMI WG the issues of language and communication across conflict zones, as well as the importance of safeguarding freedom of expression as a necessary component for an environment of meaningful collaboration. The discussion also highlighted the importance of the internet, particularly as the access to new media offers previously unaccounted for opportunities in bridging the information and communication gap. Tune in on Thursday 25 August, at 18:45, CyBC Radio 2, to hear CCMC’s Michael Simopoulos in conversation with Rosie Charalambous, on the ‘Round and About’ programme. The discussion will focus on CCMC’s upcoming collaboration with the Community Media Forum Europe (CMFE) on CMFE’s first Annual Conference on community media, to be held in Nicosia’s Buffer Zone on 17-19 November. The conference will focus on a whole range of issues, including the present state of Community Media in Europe, community media’s role in promoting intercultural dialogue and participation, as well as an assessment of the potential for community media in Cyprus. For more information visit the conference homepage – http://www.cmfe.eu/conference2011. Stay tuned! The Collaborative Media Initiative (CMI) two-day conference entitled ‘Collaboration in Media: Sharing experiences, Paving the way for the future in Cyprus’, took place on 23-24 June 2011, at the Home for Cooperation in Nicosia’s Buffer Zone. The conference, inaugurated by Lisa Buttenheim, Special Representative of the UN Secretary General in Cyprus, aimed to strengthen dialogue on innovative approaches to media collaboration, and offer interim solutions for the future of media in Cyprus. Conference proceedings were in English, with simultaneous translation to Greek and Turkish. Download the flyer in English, Greek and Turkish. PRESS RELEASES AVAILABLE HERE IN ENGLISH, GREEK, AND TURKISH. POST EVENT PRESS RELEASE AVAILABLE HERE. For those of you unable to attend, you can download the presentations of the speakers here: Jean-Francois Pellier (ARTE TV) Presentation Dimitra Milioni (Cyprus University of Technology) Presentation Gordana Igric (Balkan Investigative Reporting Network) Presentation Holger Briel (University of Cyprus) Presentation Nico Carpentier (University of Loughborough) Presentation Dusan Babic (FTV, Sarajevo Broadcaster) Presentation. Everyone associated with the Cyprus Community Media Centre (CCMC) was delighted to see the successful launch of Anahtar Media, a joint venture between Radio Astra and Radyo Mayis. The two stations produced their first joint, live, simultaneous, on-location broadcast from the Home for Cooperation on Friday 24 June, to mark the close of the two-day conference organised by the Collaborative Media Initiative. As the third partner in the Anahtar consortium, CCMC looks forward to contributing further to the initiative in the months to come. It is our belief that the will, determination, and innovation displayed by Astra and Mayis can become an example to others who seek to improve relationships and collaboration with colleagues across the divide in Cyprus. CCMC stands ready to support organisations and individuals from across the island who share the same goals and aspirations.